In designating this event a safer space, we are making an explicit political decision to prioritise the voices of people who are experiencing oppression at the hands of another person so that they feel empowered to participate and feel supported by a radical community. We are not a judge and jury, we are not the cops; but we are a community with shared ideals about the rights of people to feel free of oppression. People attending this camp are asked to be aware of their language and behaviour, and to think about whether it might be offensive to others. This is no space for violence, for touching people without their consent, for being intolerant of someone's religious beliefs or lack thereof, for being creepy, sleazy, racist, ageist, sexist, hetero-sexist, trans-phobic, able-bodiest, classist, sizist or any other behaviour or language that may perpetuate oppression. 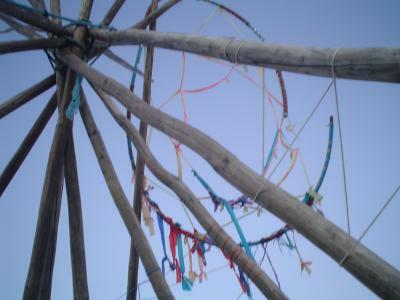 Abuse and discrimination will not be tolerated at this Rainbow Circle camp; nor will targeted harassment, assault, sexism, homophobic or racist behaviour. Everyone who attends this Rainbow Circle camp is expected to engage with respect, adhere to, actively create and enforce if necessary the creation of a space that contrasts with the sexist, racist, oppressive norms of mainstream society. There will be a no-tolerance policy for sexual or physical violence, persistent harassment, or threats of sexual or physical violence. Anyone violating this may be asked to leave and will not be welcome at the event. This process is not easy. Please question in advance your capacity to deal with being asked to leave the space if necessary and how you would react in a progressive way if you or a friend of yours was called out for abusive behaviour. Alcohol and other drugs are not an excuse for bad behaviour. Everyone can expect to be held accountable for their behaviour regardless of the effects of alcohol or drugs. For this reason we ask that you be aware of your capacity to remain in control of your emotions, actions and reactions if consuming alcohol or other drugs. Respect people's physical and emotional boundaries. Always get explicit verbal consent before touching someone or crossing boundaries. Respect people's opinions, beliefs, and different points of view. Be responsible for your own actions. Be aware that your actions do have an effect on others despite what your intentions may be. Take responsibility for your own safety and get help if you need it. Look out for children and try not to leave anything around that could endanger them. Be mindful of how children are interacting with each other (ie: bullying dynamics). No alcohol or other drugs in our camp space: be aware of and responsible for your actions if under the influence of alcohol or other drugs. Be aware that raising your voice or other aggressive body language may be understood as abusive behaviour by others. Our safer spaces policy includes supporting survivors by asking that people who have perpetrated sexual or physical violence not attend this event, or that they amend their behaviours at the event (ie: not drinking alcohol), at the discretion of those harmed and the Mediators, Coordinators, WWG or Council or other affected persons. We see this as a political stance in amplifying the empowerment and inclusion of survivors and challenging an oppressive culture. This Rainbow Circle camp has a Mediation Circle with people on-hand to help with possible conflict, mediation, support and enforcement of the safer spaces policy. If you experience or witness any behaviour that crosses your boundaries or makes you feel uncomfortable or if you are feeling like you would like to talk to someone confidentially about anything please feel free to talk to a Coordinator or member of our Mediators Circle, WWG, or Council. These people will be readily identifiable and will not breach your confidentiality without your permission. There may be conflict during the time that we are at this camp and the organisers have designed a basic process for dealing with this. This process is based around the principle that a resolution deemed positive to all parties involved should always be sought first, but that a survivor’s right to feel safe and empowered is the key priority. If any conflict arises that anyone feels cannot be resolved without some help, they should seek the assistance of a Coordinator or one or more members of the Mediators Circle WWG, or Council. If the harmed person in a conflict (ie: survivor of abuse or harassment) is not satisfied with a proposed resolution, they have the option of taking the issue to the Rainbow Circle Council to make a final decision on what action needs to be taken. In dealing with conflict, Rainbow Circle will be survivor-centred, meaning that the survivor's rights will always be prioritised.